I’m very familiar with The Dresden Files, having seen episodes of the series on the SciFi Network; read some of the graphic novels; and read short stories of the series in various anthologies, but I’d yet to read the actual book series. And while I’ve been fortunate to receive a LOT of Advance Reader’s Copy of new books from many publishers, this particular title has been around for a few years, so scoring a ‘free’ copy from the publisher wasn’t likely. Enter Benjamin Franklin and his FREE Public Library. I have to admit that I was a little surprised to discover a science fiction/fantasy series that was well over a dozen books in to its series and yet I hadn’t read any of the books. I’m very pleased to find that this series (at least this first book) is well worth the attention it has been getting. Harry Dresden is a wizard. Harry Dresden is also a private detective. occasionally the two work together. A council of wizards is keeping a close eye on Harry, believing that Harry is performing black magic and killing people. When the local police call Harry in on a double homicide case, he discovers that there is someone with incredible magic powers and because the council believes Harry is the one responsible, Harry is on his own to find and take down whoever it is. Author Jim Butcher captures a noir-ish detective ‘voice’ for the character while keeping him modern with the magical abilities. This isn’t deep, intensely provacative literature, but it is great fun. Those Harry Potter fans who are now in their mid-twenties might really enjoy this step up in fantasy literature. Looking for a good book? 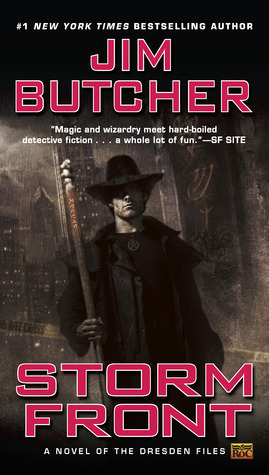 Storm Front, the first in the Harry Dresden series really satisfies.